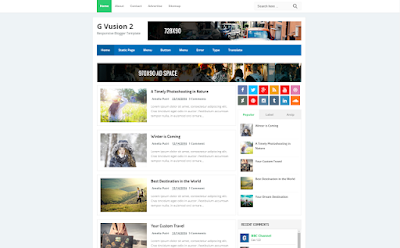 TemplateHack.com - Download G Vusion V.2 template blogger premium. G Vusion 2 The Responsive Blogger Template update is the second version of the template that I have shared on the Arlina Design blog, but this time it is an update from version 2. Many of the changes I made to this version 2 template included on display, more SEO, more responsive and many more. If you are already impatient and interested in G Vusion V.2, please click the button below.